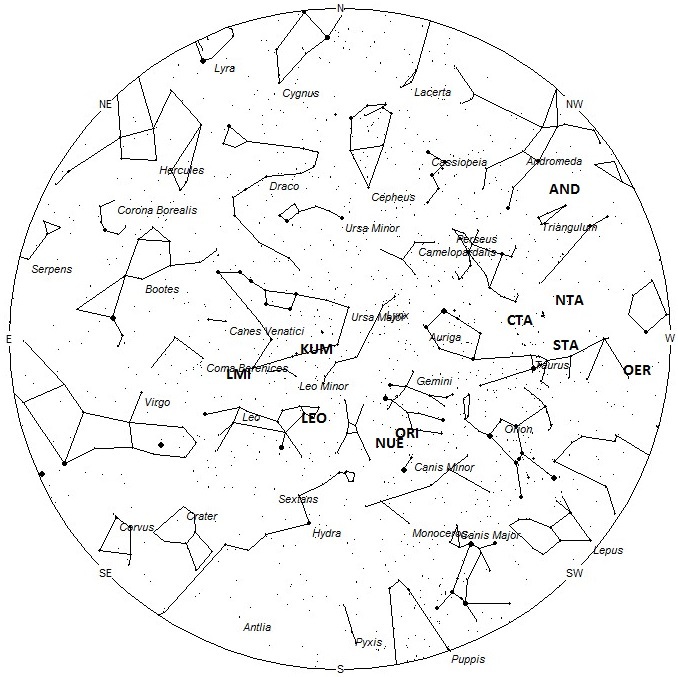 The omicron Eridanids (OER) were discovered by Japanese observers using video data from SonotoCo in 2007-2008. 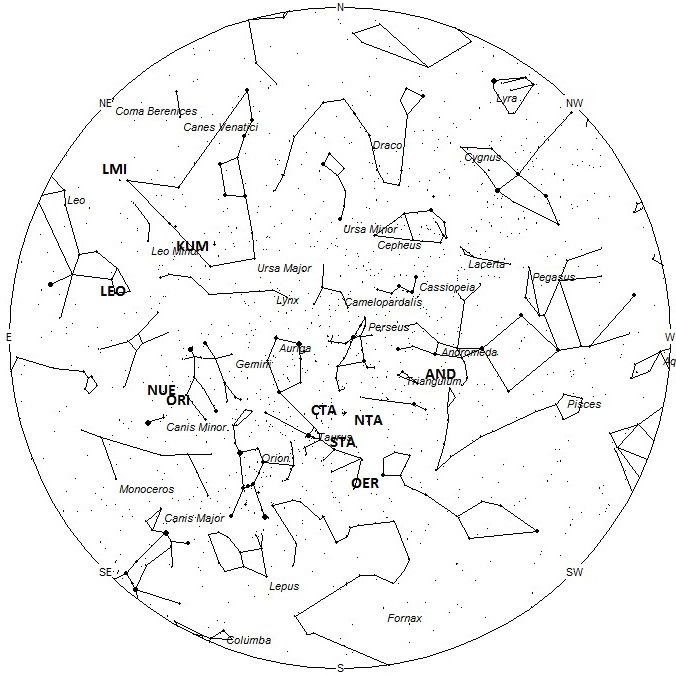 The activity period ranges from October 16 – November 24 with maximum activity occurring on November 4th. This is a weak shower that usually produces rates less than 1 per hour, even at maximum activity. The radiant is currently located at 03:36 (054) -02, which places it in northwestern Eridanus 10 degrees southeast of the 3rd magnitude star known as Menkar (alpha Ceti). This location is close to the source of the Southern Taurids so care must be taken to separate these meteors. Like the STA’s these meteors may be seen all night long but the radiant is best placed near 0100 LST when it lies on the meridian and is located highest in the sky. 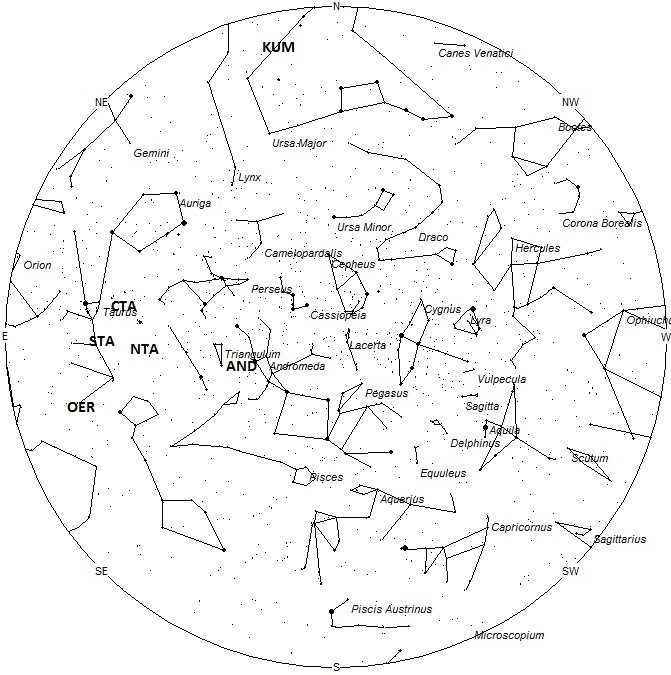 With an entry velocity of 29 km/sec., the average omicron Eridanid meteor would be of slow velocity. The first Leonids (LEO) of the season should begin appearing this weekend from a radiant located at located at 09:24 (141) +27. This position lies in northwestern Leo, just east of the 4th magnitude star known as Al Min’ħar al A’sad (kappa Leonis). Current rates are expected to be near 1 shower member per hour during the late morning hours as seen from the northern hemisphere. Hourly rates from south of the equator would be less than 1. Maximum is predicted to occur on November 17. The Leonid radiant is best placed during the last hour before morning twilight when the radiant lies highest in a dark sky. Leonids may be seen from the southern hemisphere but the viewing conditions are not quite as favorable as those north of the equator. With an entry velocity of 70 km/sec., most activity from this radiant would be of swift speed with numerous persistent trains on the brighter meteors.